Mama Chiku's, 2017, acrylic and oil on canvas, 26" x 32"
Sketch for Mama Chiku's, 2017, acrylic on paper, 11" x17"
These paintings investigate memory- what is obscured, what disappears, and what remains. Personal reminiscences of the Kenyan landscape, with its quirky architectural additions, combine with memories of simultaneously feeling like a tourist and a local in the place I called home. The kiosks in these landscapes embody the contrasting worlds of native and foreigner, both describing my experience of growing up in East Africa. A roadside stand selling curios, a tourist trap, seems at first a superficial invention of memory. A traveler spends his leisure money on purchasing something exotic and useless that locals rarely own, placing it on his mantelpiece at home as a whimsical souvenir. Simultaneously, this tourist trap calls to mind the local Kenyan who opens the curio stand before the sun peeks over Kijabe Hill. My recollections are those of an outsider, yet also a resident- admiring souvenirs, yet buying necessities at a village stand like Kings Mini Shop. Nostalgically reminiscing has become paramount to my art-making practice, and is a mental vehicle to the beauties and joys of Kenya and the past. Mt. Kenya Curio Shop, 2016, oil on canvas, 48" x 72"
King's Mini Shop, 2016, oil on canvas, 30" x 45"
Kiosk, 2015, oil on canvas, 13" x 22"
Idealization, misconceptions, and generalizations are widespread in the context of assumptions surrounding the East African landscape, a landscape I have inhabited for the majority of my life. Seeking to authentically recollect visual experiences, I paint particularities such as vehicles, roadside shacks, and orange dirt, that all contribute to giving these environments unique senses of place. Formally referencing western landscape painting's traditional use of atmospheric perspective, vibrant colour and warm light, I explore the relationship between romantic western perceptions of idyllic "Africa" and its modern actuality. The Dukas, Kijabe, 2015, oil on canvas, 24" x 36"
Naivasha Road, Nairobi, 2015, oil on canvas, 24" x 36"
Limuru, Kenya, 2015, oil on canvas, 24" x 36"
Banana Hill, Kenya, 2016, oil on canvas, 24" x 36"
“One Who is There” and "One Who is There II" are narrative paintings that relate as a diptych, recalling events that occurred while I was living in East Africa. 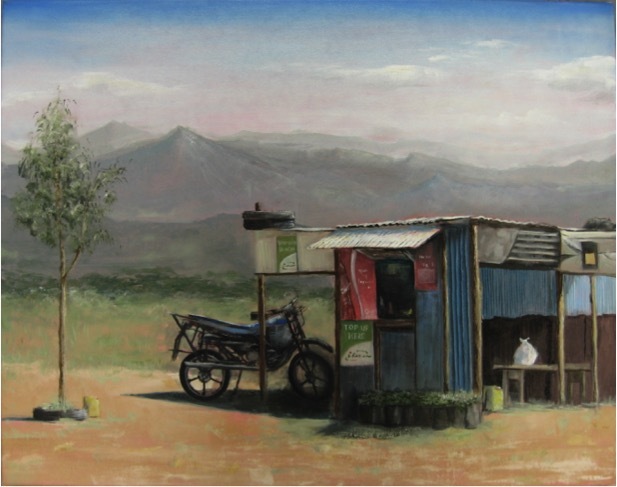 The left painting captures a scene from a story that circulated about a local in the town I lived in: Kijabe, Kenya. This man had founded a ‘safe house’ for boys who had previously been living on the streets. The house was founded close to a mission station, where missionaries heard of the project and gave generously to the man and his cause, until he was noticeably wealthier than the surrounding community. Disaster struck when this safe house was set on fire by members of the community. The relaying of this sad tale of privilege and jealousy does not seek to point fingers at an offending party, but speaks on the naivety of foreigners and the strange relationship between mzungu- “white people”- and East Africans. The right painting is a story of redemption, as an mzungu missionary's Land Rover is used to transport a man quickly to a hospital who otherwise may have died from the bee stings he had suffered. The missionaries remain unseen, barely suggested in these moments: just the driver, an observer, a bystander, one who is there. More focus settles on the East African idea of community, and what it means to be a united community, having any and every level of involvement, from watching to moving to pouring. Another reminder of the human capacity for hurting and helping. One Who is There, 2016, oil on canvas, 36" x 57"
One Who is There II, 2016, oil on canvas, 36" x 57"
Avocado Diptych, 2015, oil on panel, 24" x 36"
Abundance, 2016, oil on canvas, 22" x 13"